Yesterday’s Macro Monday was obviously a bit of a stinker, despite the fact that it was not very macro at all! 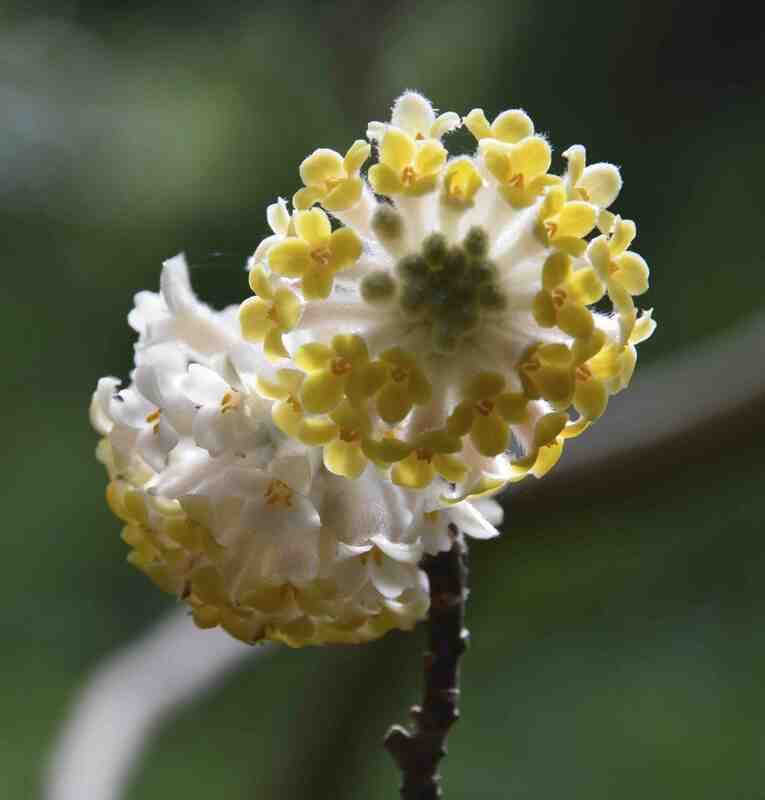 The mystery plant was Edgeworthia chrysantha, a Chinese shrub that has been cultivated in China, Japan and Korea for centuries. It was introduced to Britain in the mid 1800s and yet is still barely known. It is a remarkable plant in many ways but, to get the basics out of the way first, it is related to daphnes and flowers in early spring. It prefers a moist, humusy soil and will tolerate part shade or full sun and will grow in acidic or neutral soil. There is some doubt about its hardiness and most references say it will survive to -5c though others reckon it will go lower. My plant grew slowly in a raised, acid bed but the winters of 2010 and 2011 did away with it. It needs a sheltered spot really. It is a very distinctive plant, apart from the heads of fragrant, yellow flowers in the depths of winter. It may sound bizarre but it is something like a hardy plumeria (frangipani) crossed with a daphne. It has a rather gaunt habit with thick stems that branch only occasionally and the leaves, which are large and paddle-shaped, are held at the ends of the stems – hence plumeria-like. When these drop in autumn they reveal the reddish bark and the drooping clusters of buds at the ends of the shoots. These, and indeed the flowers themselves. are covered in silky hairs. In January when the bud clusters start to swell, the bush, which can easily reach 1m high and wide but can be bigger, looks like it is strung with silky baubles. The flower clusters open from the outside and almost resemble a lantana. 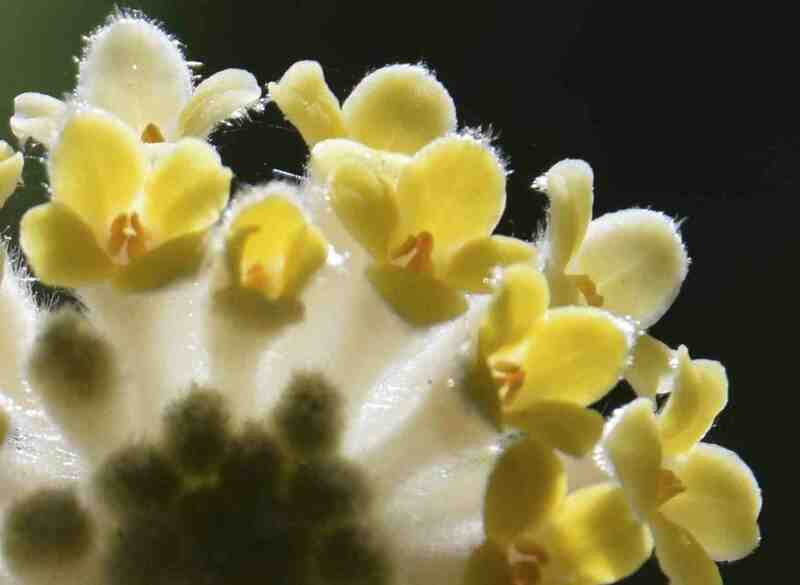 The flowers are about 2cm long and the clusters of flowers, though flat at first, are domed when mature and the older flowers age to cream with the younger blooms richer yellow. It is odd in lots of other ways too. The branches are amazingly flexible and, if you are so inclined, you can tie them in knots – something that must have potential for making a grotesque bonsai. And the stems are unusual too because when they branch they split into three equally vigorous stems – leading to the Japanese name mitsumata. Part of the reason it has been cultivated in the East for so long is because its bark is used for making very high quality paper. Japanese bank notes used to be made from the bark. The genus has four species and the other in European cultivation is E. papyrifera although there is some suspicion that they are the same species and E. chrysantha is a tetraploid form. The colour of the flowers varies from pale cream to bright yellow and there is even ‘Red Dragon’ which has striking, copper coloured flowers but, allegedly, no scent. Edgeworthias have an Irish connection, being named after Michael Pakenham Edgeworth (1812–1881). He was born in County Longford, and joined the Bengal Civil Service and collected plants in Aden (Yemen), India and Sri Lanka. There is a good sized one growing in Mount Usher gardens, but I have only managed to keep a plant growing in the garden for four/five years and friends have had the same experience. The curator at Mount Congreve has just planted one in the garden, so it will be interesting to see how it survives.